Livigno is one of the most important and well-equipped ski resorts in the Alps. Located btewen Stelvio National Park and the Swiss National Park, it's very accessible from northern Europe. Over the years Livigno has gained the nickname Little Tibet thanks to it's peaceful mountain location tucked between the Bernina Mountain Range to the south and the Ortles – Cevedale Mountain Range to the east. 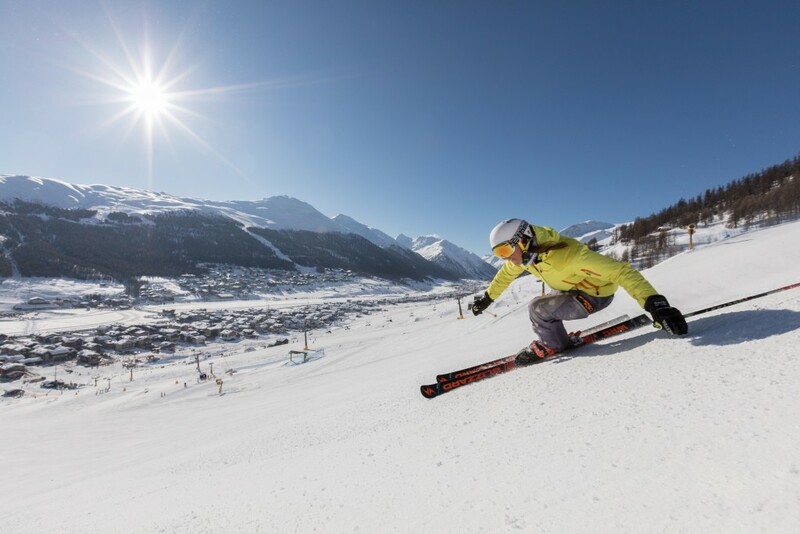 At Livigno there's something for everyone: 12 black slopes, 37 red slopes and 29 blue slopes. Expert skiers can satisfy their thirst for speed on long and technical runs like the Giorgio Rocca trail. Families and beginners can enjoy gentle slopes and fun areas suited for learning basic techiques and for learning by playing. Little Tibet also has modern ski lifts: 6 gondolas, 13 chair lifts and 11 ski lifts for a total hourly capacity of over 47,000 people. From December to May, the cold, dry climate assures snow on the resort's 115 km of slopes, which range from 1816 m to 2950 m in altitude. The favorable position of the valley, which runs from north to south, guarantees sunny slopes from morning till night on both the the opportunity to ski on both the Mottolino and Carosello 3000 sides of the vally. Snowmaking capabilites assure skiing on 70% of the slopes. Snowboarders can choose between 3 snowparks: Snowpark Amerikan (the newest addition to Livigno), Snowpark Mottolino (replete with superpipe, halfpipe, rails and kickers), and Livigno Park Carosello 3000 (located on the Polvere trail and served by the Carosello 3000 gondola). Livigno has a lot to offer for non-skiers as well. There's bobsledding, tubing, snowshoeing and nordic walking. Adventurous types can even go ice climbing. Plus there's ice skating, snowmobiling, go-kart and car driving on the ice, snow biking and horseback riding in the snow. Get Snow Reports, Powder Alerts & Powder Forecasts from Livigno straight to your inbox! Italy has three ski resorts in the 'best value' top 10 list this year and Austria is just behind with two. Free Ski Pass For Livigno!